When you’re trying to lose weight, selecting your beverages more carefully can help you take off extra pounds. Our overview of healthy drinks is a good way to start. When it comes to healthy drinks, you can't get better than purified water. 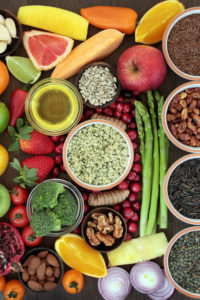 Although obesity research has revealed that numerous factors—including genetics and hormone levels—affect weight, cutting the number of calories consumed is still the most recommended method for weight loss. Depending on the beverages you usually enjoy, you can cut up to 25 percent or more of your daily calories simply by choosing healthy drinks. Soft drinks, as well as sweetened teas, gourmet coffees, juice drinks, energy drinks, and sports drinks, are common culprits when it comes to beverages. Each has a high-calorie price tag that ranges from 100 to more than 400 calories, depending on the size. You may think that “100 percent fruit juice” is a good choice, since it doesn’t contain added sugar and is made from fruits. However, juices are concentrated sources of the natural sugars found in fruits, providing 85 to 180 calories in an 8-ounce glass of juice (white grapefruit and cranberry juices are lowest, and prune and grape juices are highest). The calorie content of alcohol varies with the size and choice of drinks, but the range for most “standard” size drinks (a 12-ounce beer, 5-ounce glass of wine, or 1.5-ounce shot of liquor) is between 100 and 150 calories. The healthiest option among all beverages, of course, is water: It’s calorie-free and helps keep your body hydrated. Add a lemon, lime, or orange slice and/or mint to liven up the flavor. Several companies now offer liquid flavorings; with a few squirts, you can turn plain water into a strawberry-kiwi or mango-peach drink. However, exercise caution with these products: They may have only 0 to 10 calories, but many contain several additives and preservatives. If you do use these flavorings, add just enough to give the water a slightly “fruity” taste: Sugar substitutes, including sucralose, stevia, and monk fruit, are 200 to 600 times sweeter than sugar, and they can train your taste buds to crave even sweeter substances. Keep in mind that the fewer calories you drink, the more calories you can eat—and eating solid food registers with your brain’s hunger control center in a way that beverages do not. 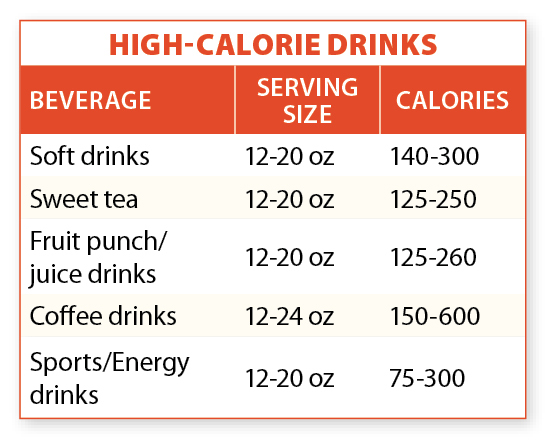 If you include one or more high-calorie drinks in your daily diet, substituting healthier choices can bring down your calorie count. Unsweetened coffee and tea are good options, and both have been linked with some health benefits. If you’re already a coffee or tea drinker but you add sugar (15 calories per teaspoon) or half-and-half (18 calories per tablespoon), gradually cut back. If you drink whole milk, switch to low-fat or skim milk, and go from 147 calories (whole) to 102 calories (low-fat) or 91 calories (skim) per 8-ounce glass. If you drink more than 4 ounces of juice per day, dilute the juice with plain water or club soda. For soda drinkers, try switching to diet soda, stevia-sweetened soda, or flavored seltzer water. add, alcohol, beer, brain, calories, coffee, diet, diet soda, energy drinks, exercise, food, health, healthy drinks, hormone, Lose Weight, milk, obesity, preservatives, report, seltzer water, stevia, sugar, weight control, wine. 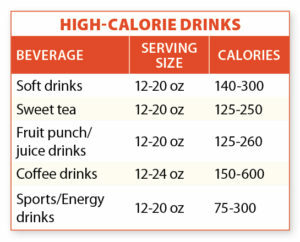 All calories count, whether it’s calories from beverages or food. With respect to obesity, it’s important to note that over the past several decades, beverage intake has been declining as food consumption has risen. What does this say? Beverages are not the culprits some would claim. America’s leading beverage companies are committed to being part of real solutions to public health challenges with initiatives like Balance Calories. This effort aims to reduce sugar and calories consumed from beverages by offering more low- and no-calorie choices and smaller sizes and then finding ways to get people to try them. We also have voluntarily placed clear calorie labels on the front of every bottle, can and pack we produce. Additonally, research debunks the myth that consuming diet soft drinks triggers increased preferences for other sweets. This study published in the American Journal of Clinical Nutrition reinforces this point, and also determined that those who consumed diet beverages in place of caloric ones consumed fewer calories than other control groups, including those who consumed only water: http://bit.ly/Ik4zjC.